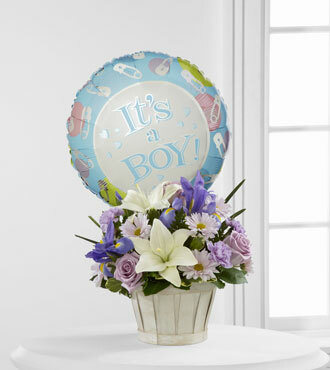 Celebrate the arrival of a new baby boy with a bouquet of lavender roses, blue iris, lavender carnations, lavender daises, and white Asiatic lilies. This simple and beautiful bouquet is arranged with fresh greens. The arrangement comes with a special balloon and a round, white basket. This is the perfect way to celebrate the arrival of a new family member with someone special.